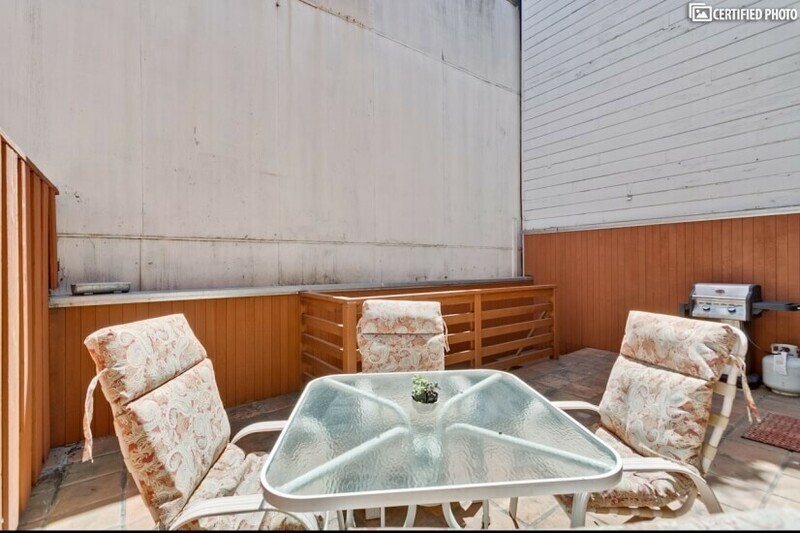 Month-to-Month only. 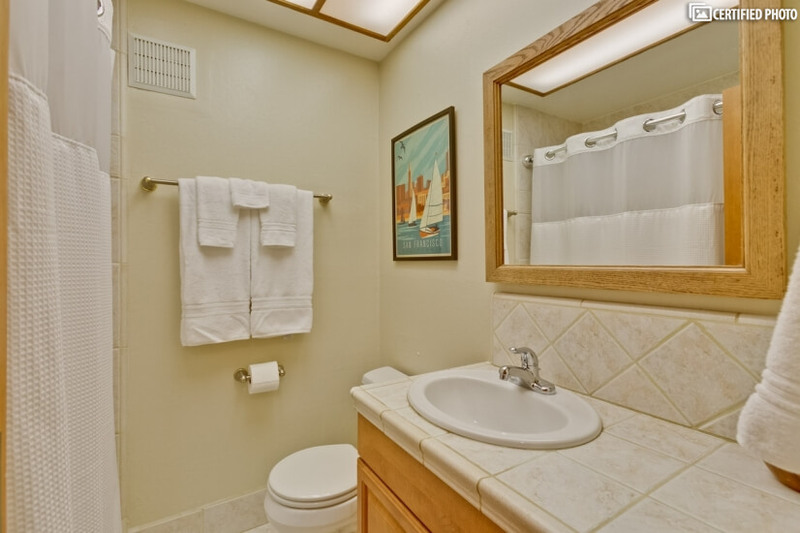 All utilities including gas, electric, water, garbage, internet and TV included. 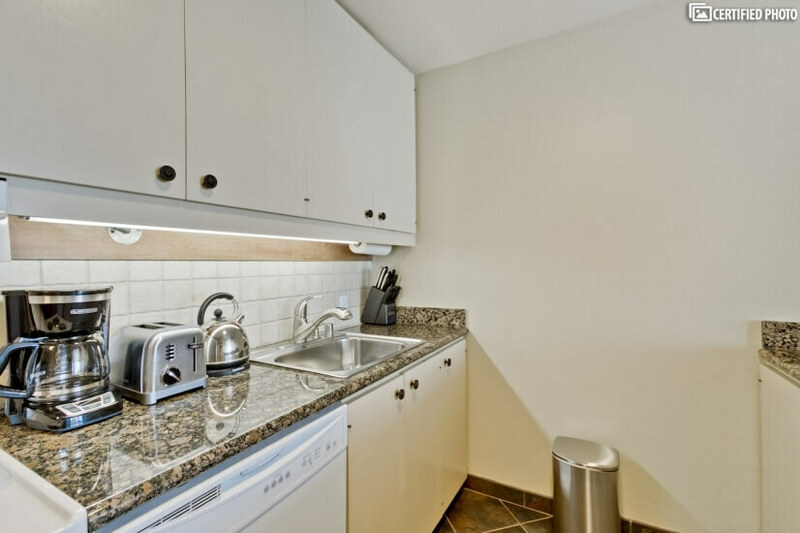 $300 cleaning deposit at end of lease term. 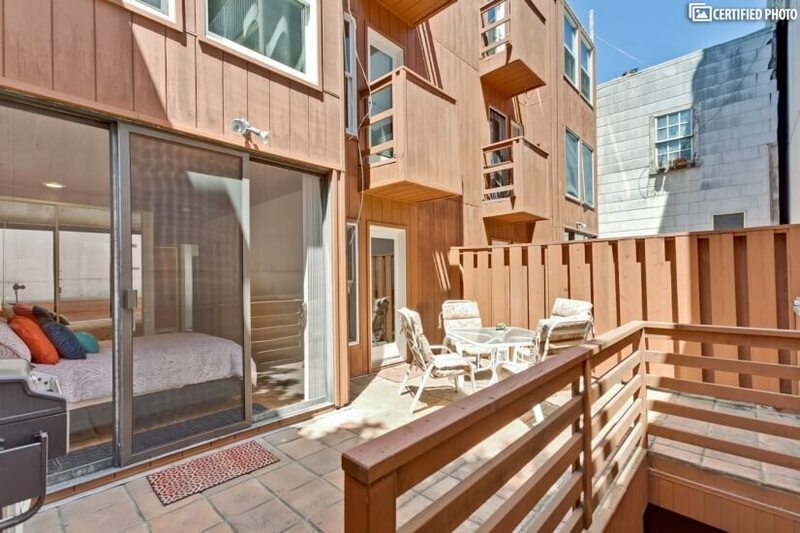 Maximum occupancy 4. 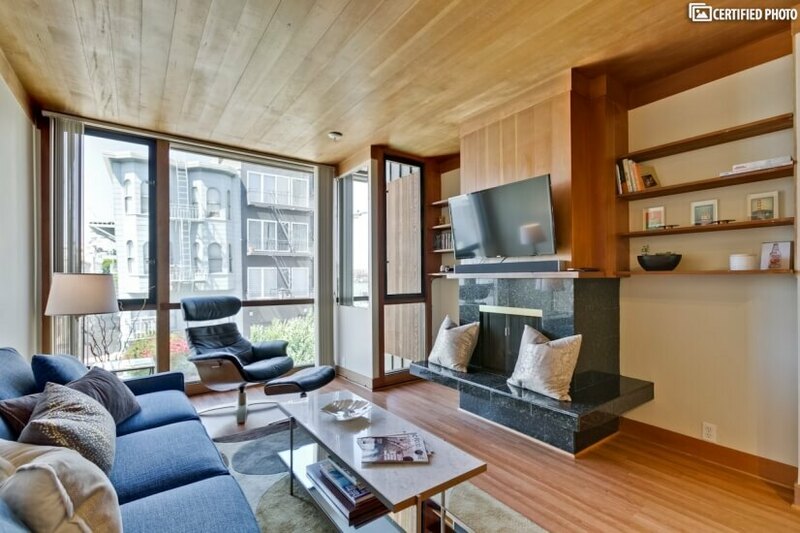 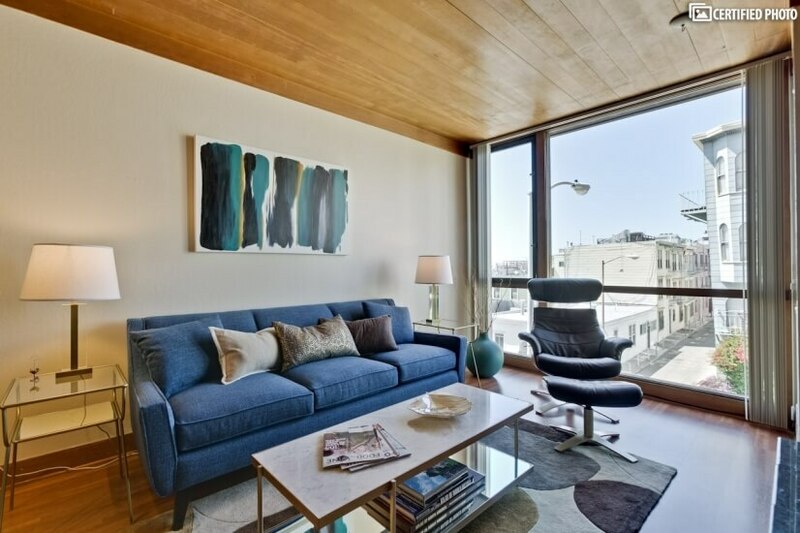 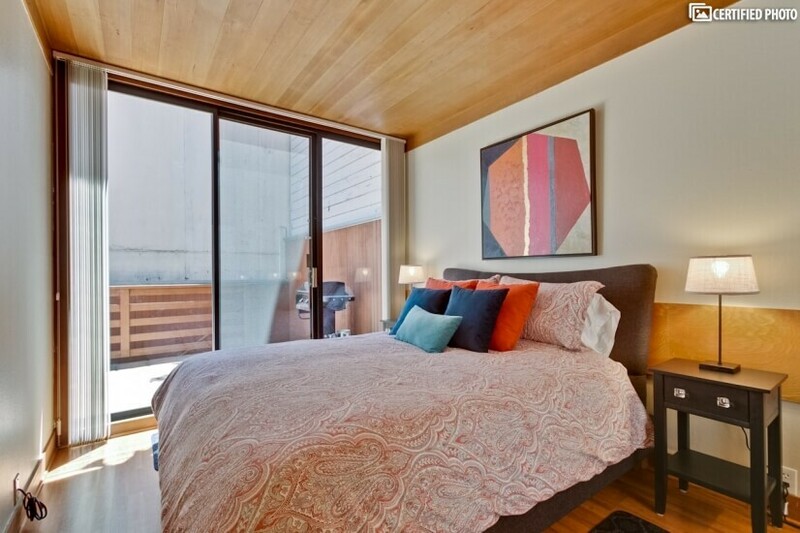 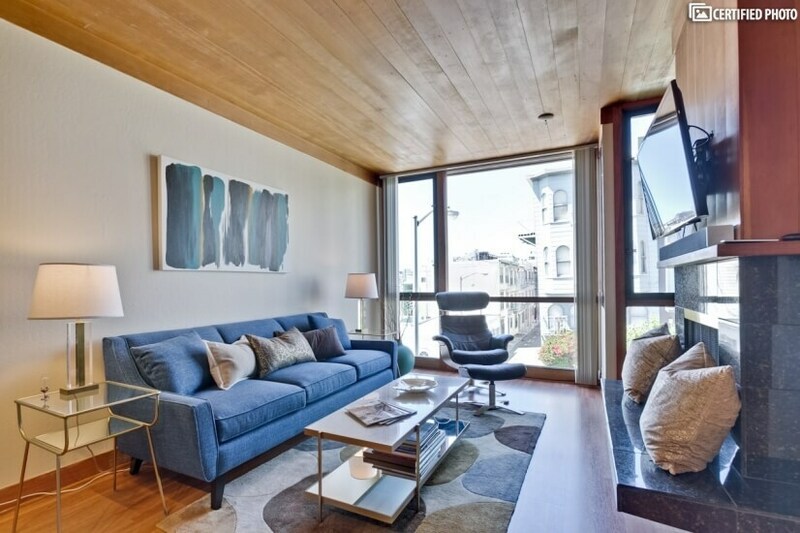 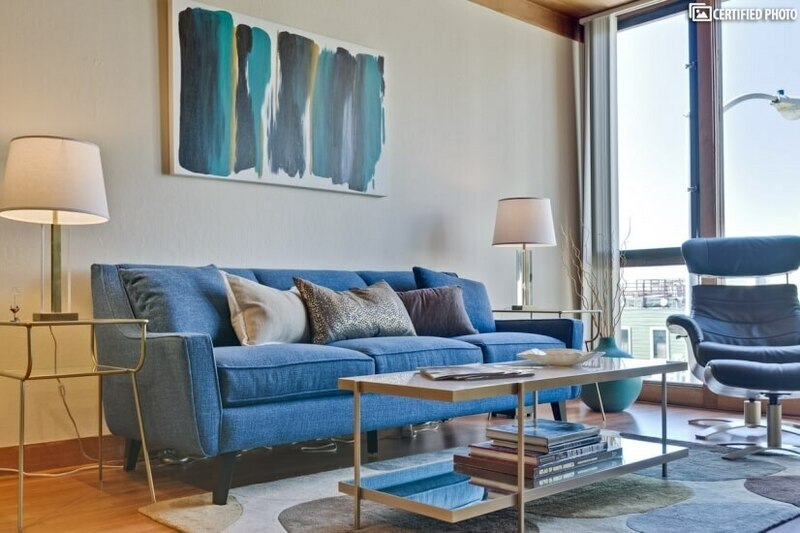 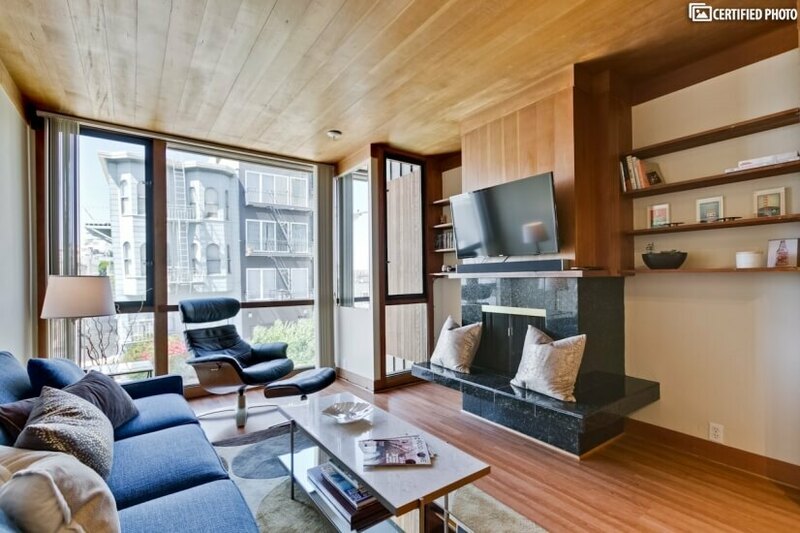 View & Location are king with this modern two-bedroom, two bath penthouse in San Francisco. 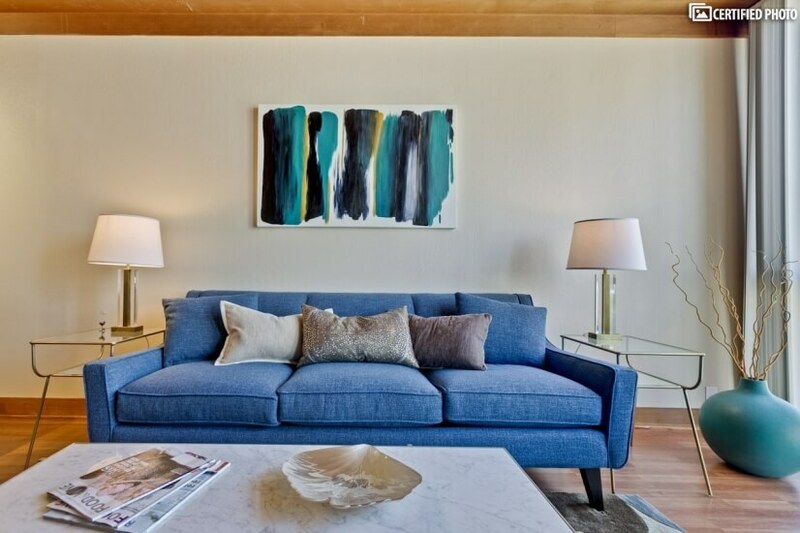 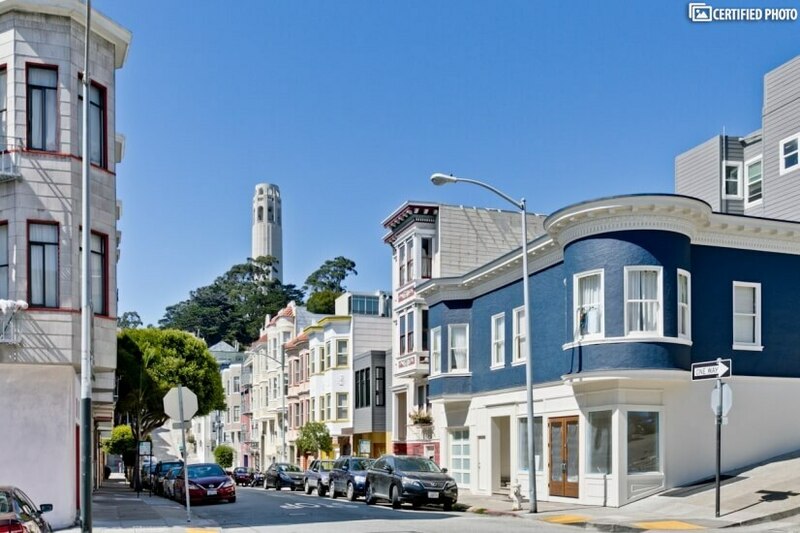 Poised at the top of Telegraph Hill in this iconic city, this gorgeous corporate rental is only ten minutes on foot to the Financial District and fifteen minutes to Fisherman’s Wharf and Pier 39. 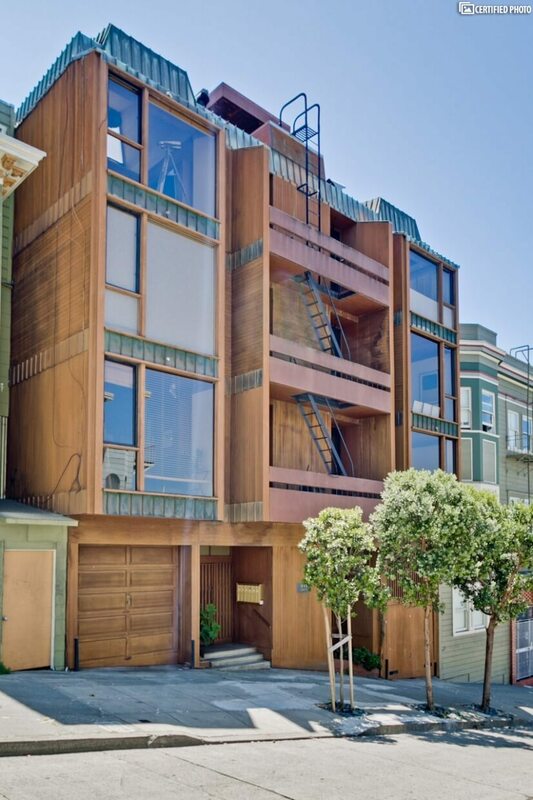 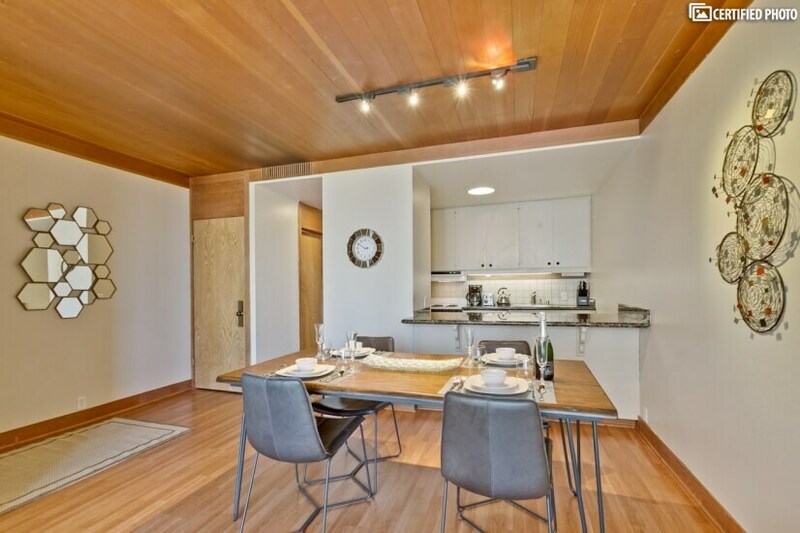 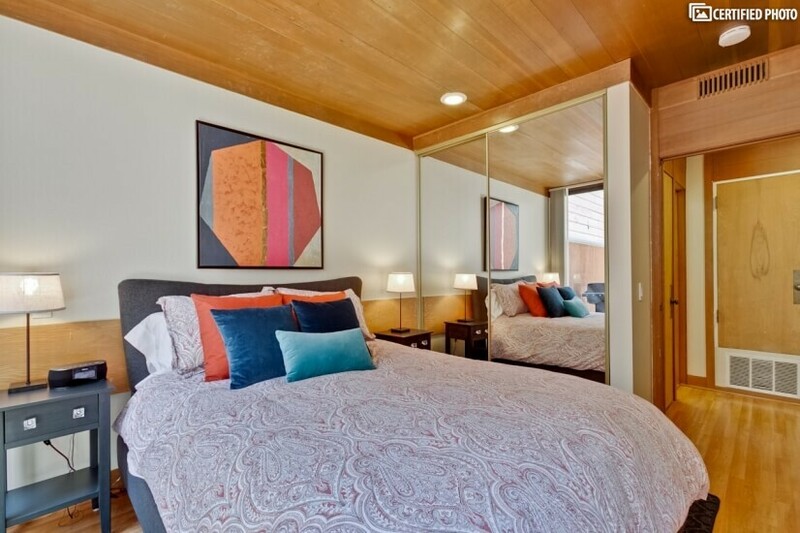 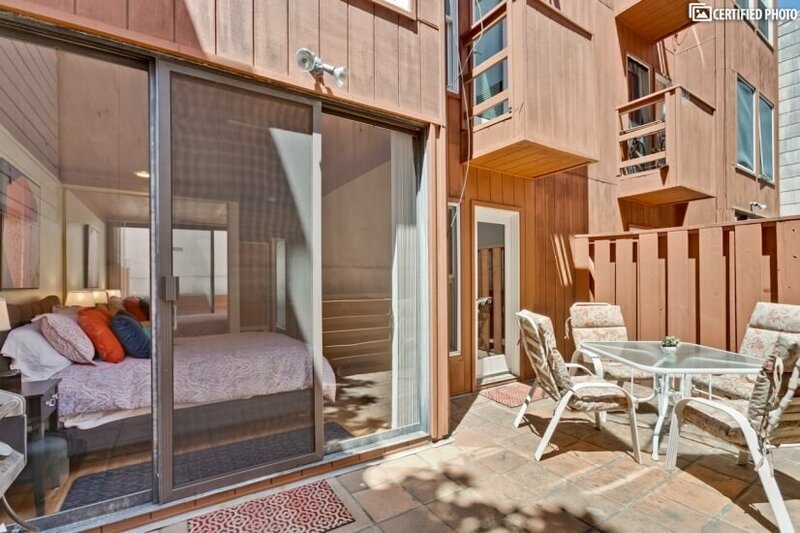 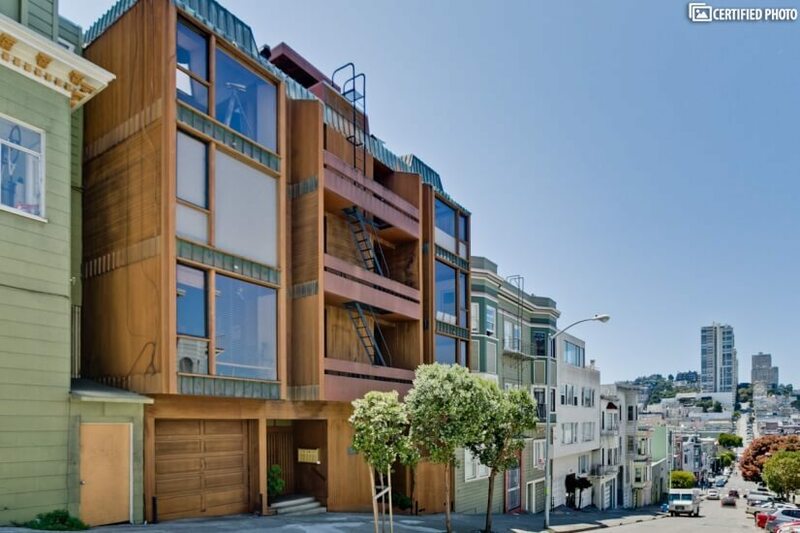 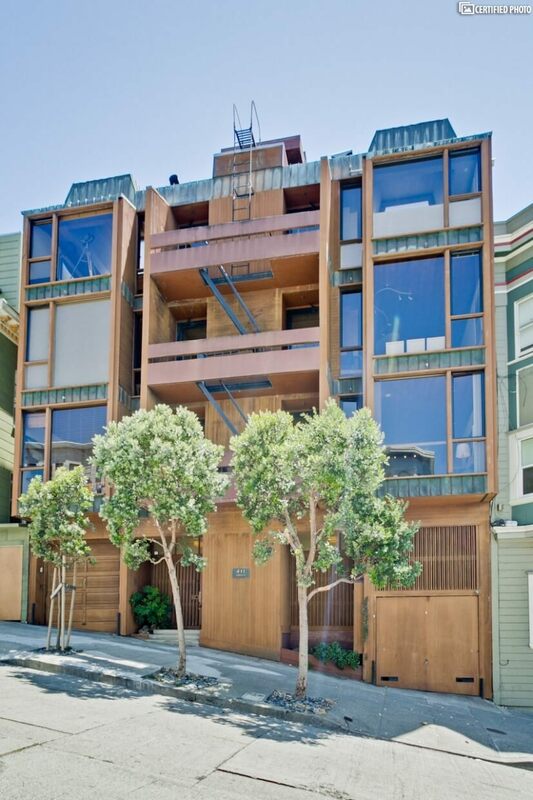 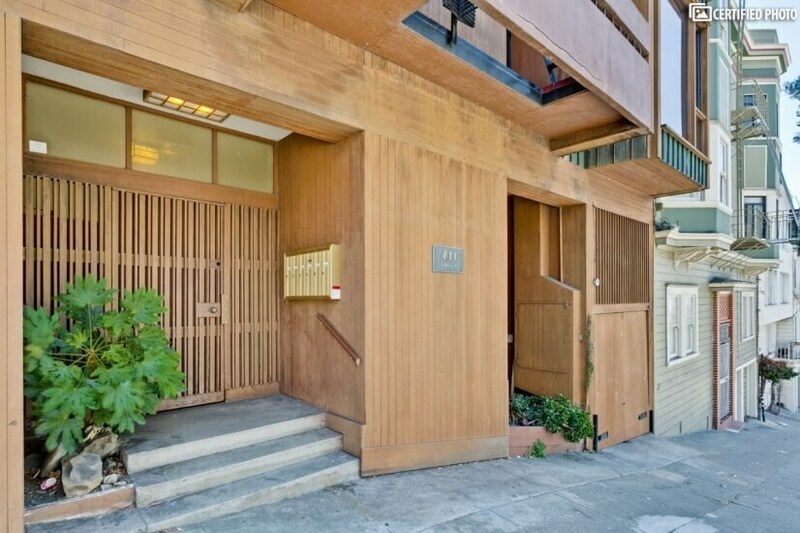 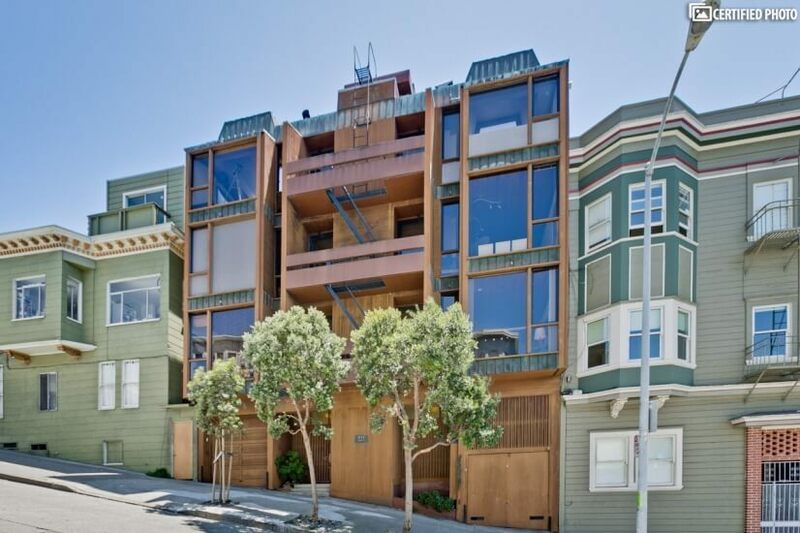 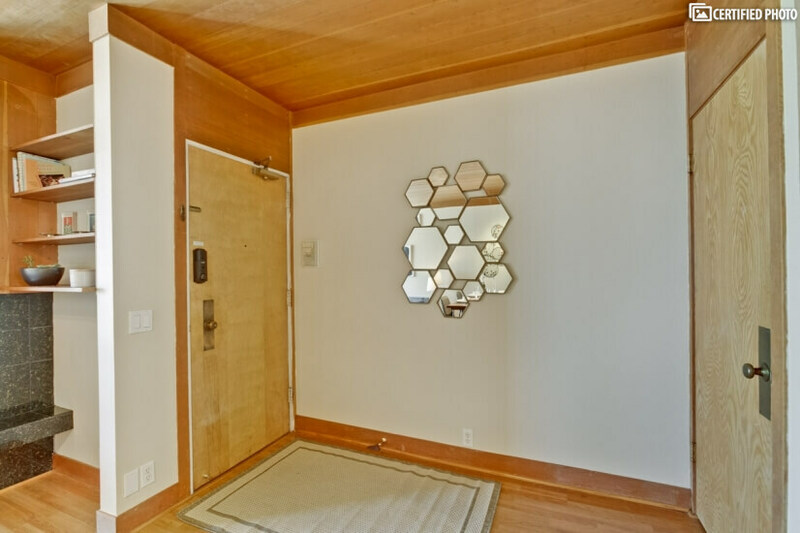 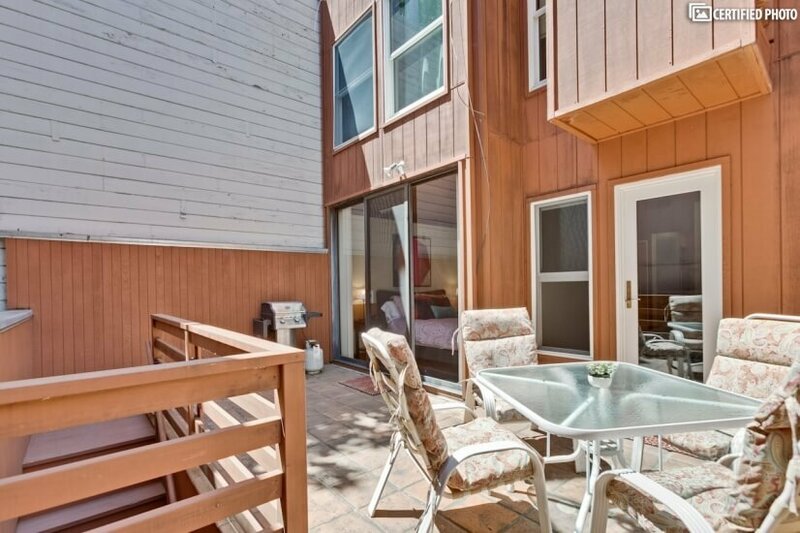 This classic row house, clad in a natural wood motif, hosts six units from which you can see the San Francisco Bay and the Golden Gate Bridge. 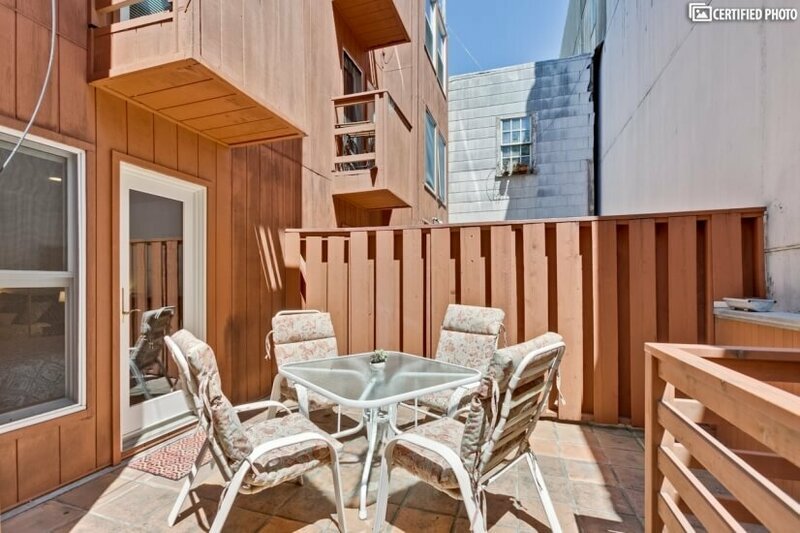 You may not need a vehicle in this 99 walk score rated rental, but there’s a standard garage space anyway, and even storage for up to two bikes. 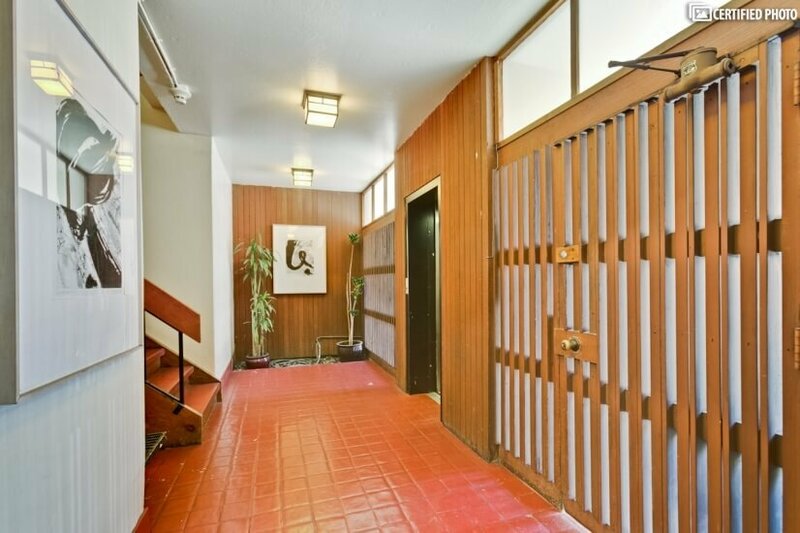 An elevator takes you up to your new home away from home. 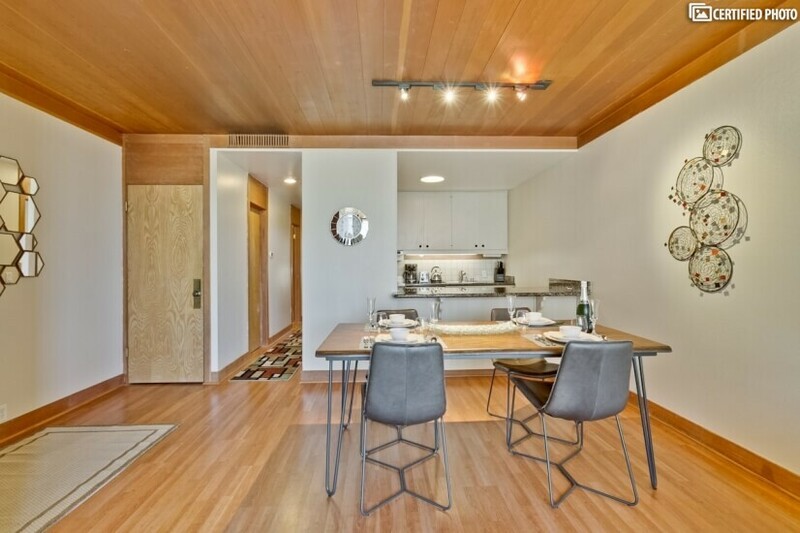 Inside, all new modern furniture and furnishings compliment natural wood flooring and a wood plank ceiling for a clean and elegant look. 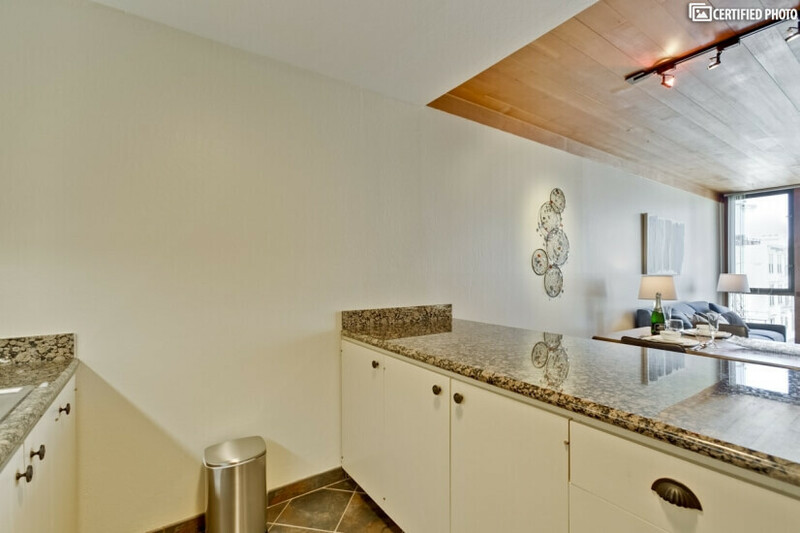 The great room combines living, dining, and kitchen in a continuous space. 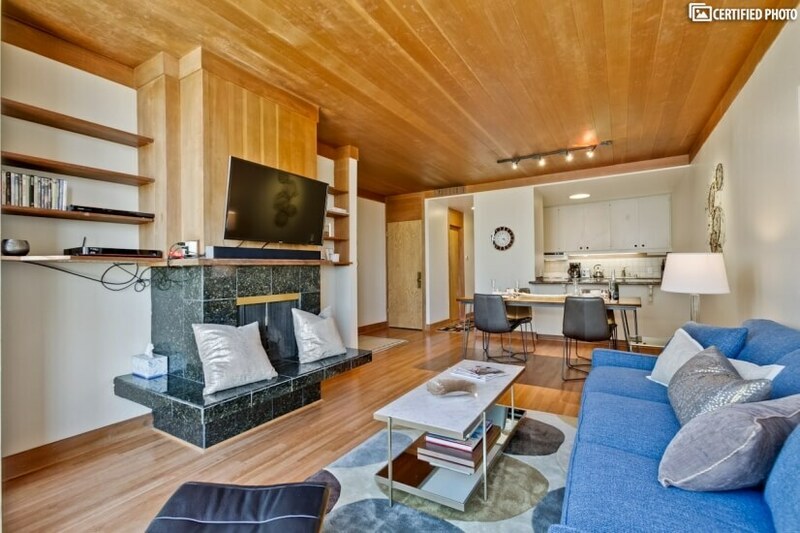 The living room is appointed with a leather captain’s chair in view of the wall mounted LCD flat screen with Comcast high-speed Internet and DISH satellite TV. 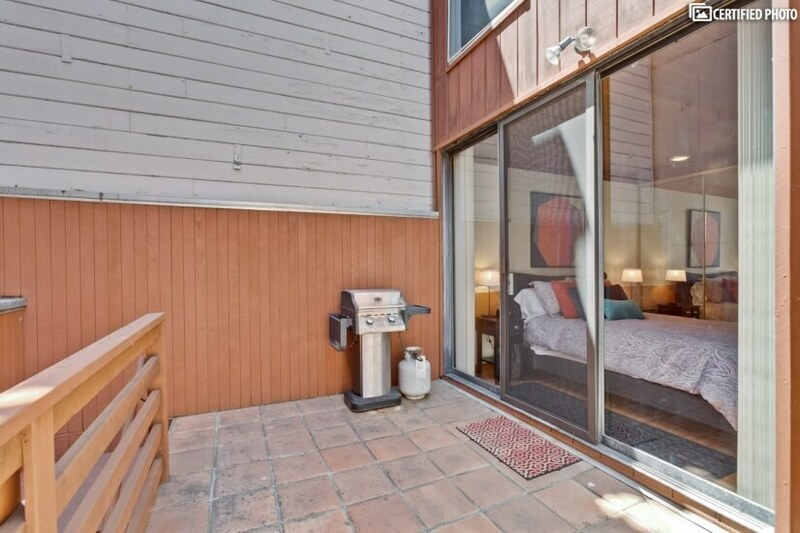 This sits above a wood-burning fireplace that will keep away winter’s chill; warmer days can be enjoyed on the private patio off the master bedroom that offers you a gas grill and patio furniture. 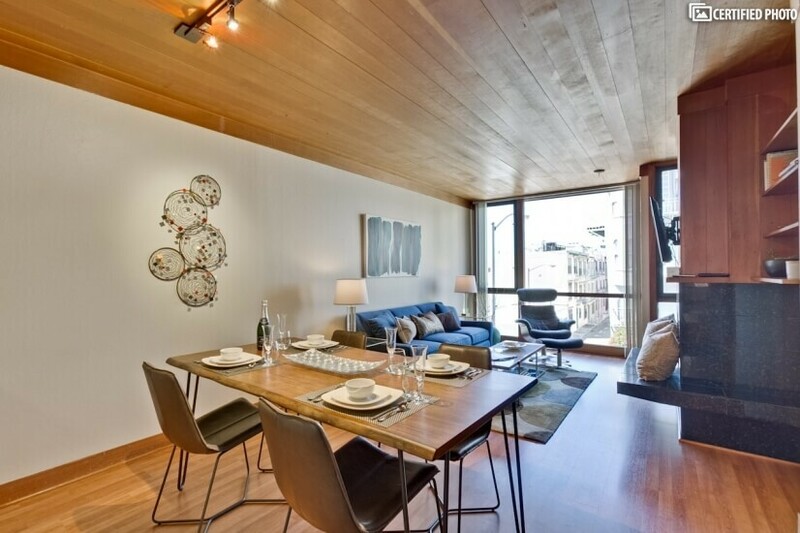 Floor-to-ceiling windows bring plenty of natural light and showcase this outstanding location. 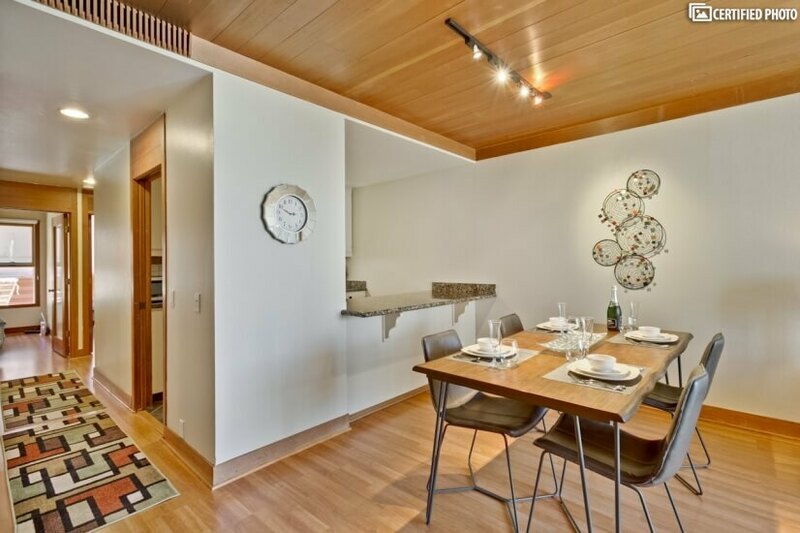 The living room flows to a dining room seating four under track lighting. 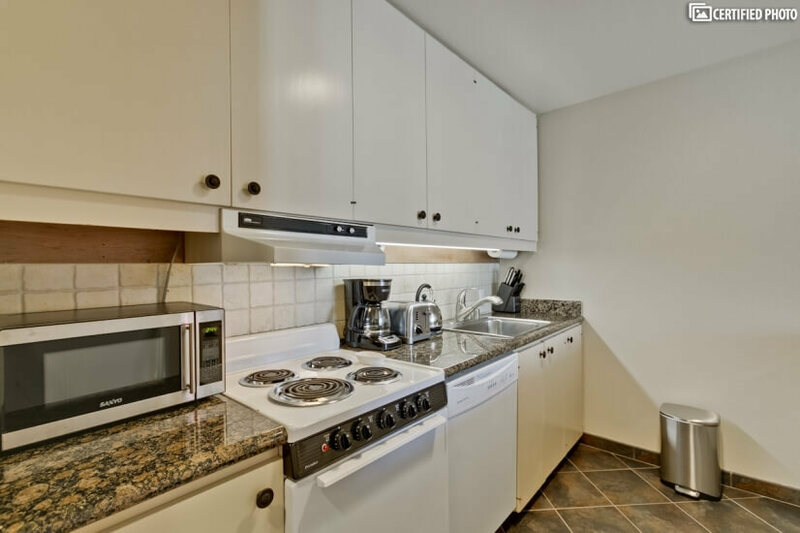 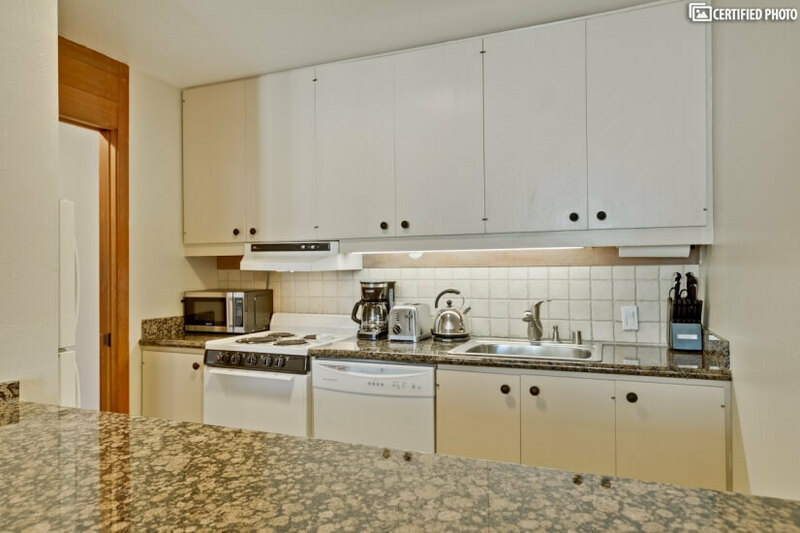 A bar counter pass over will get meals to the table via a kitchen has all new equipment, an electric stove, dishwasher, and new Frigidaire. 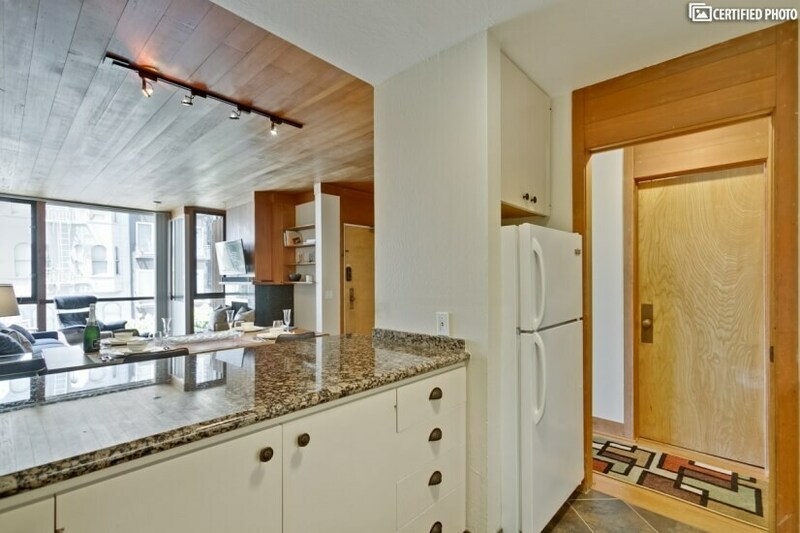 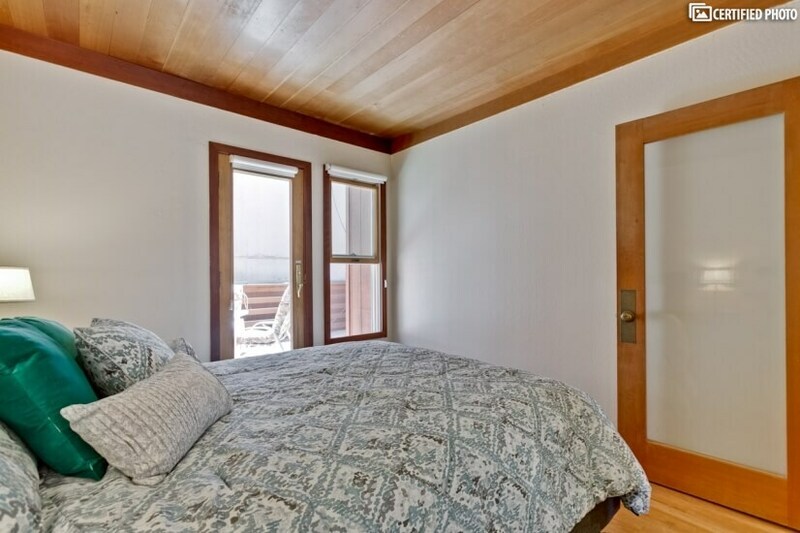 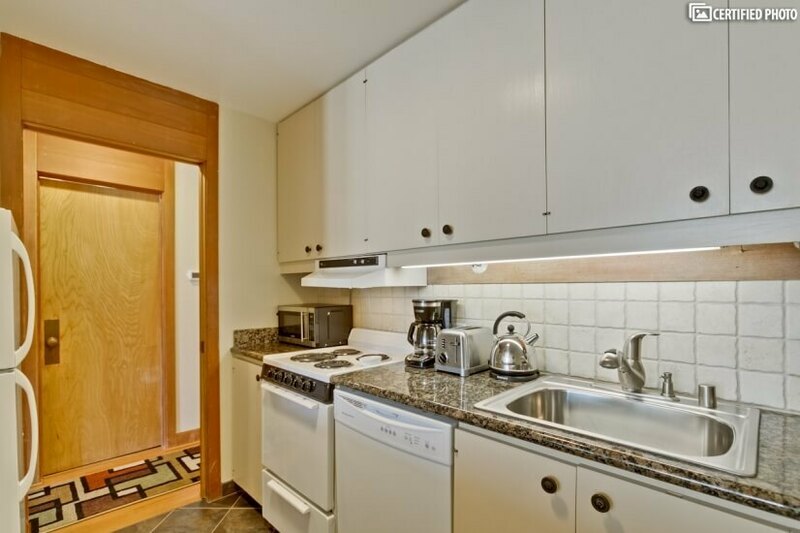 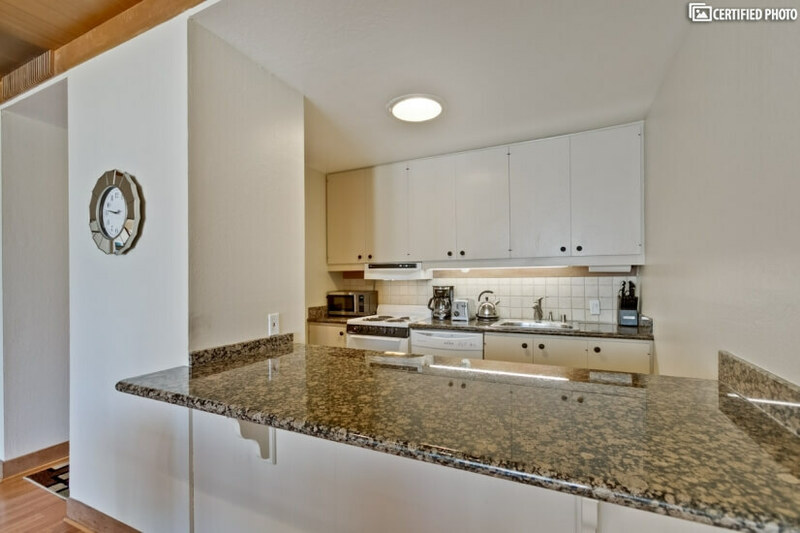 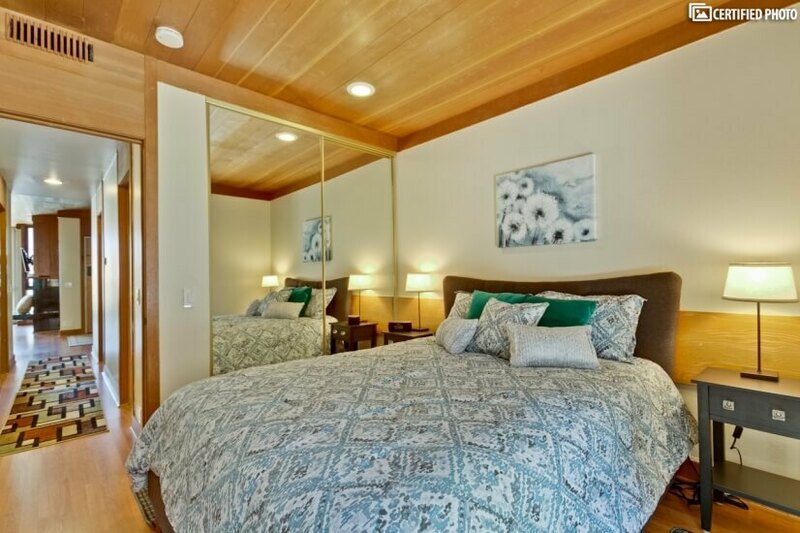 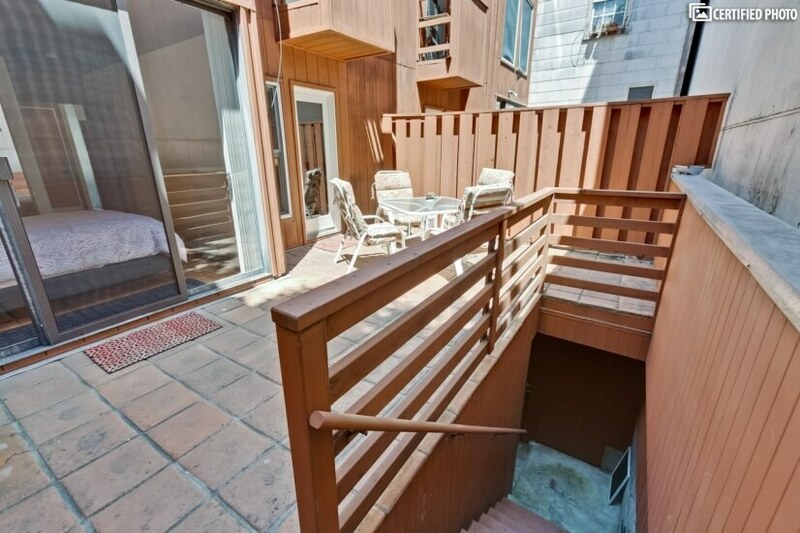 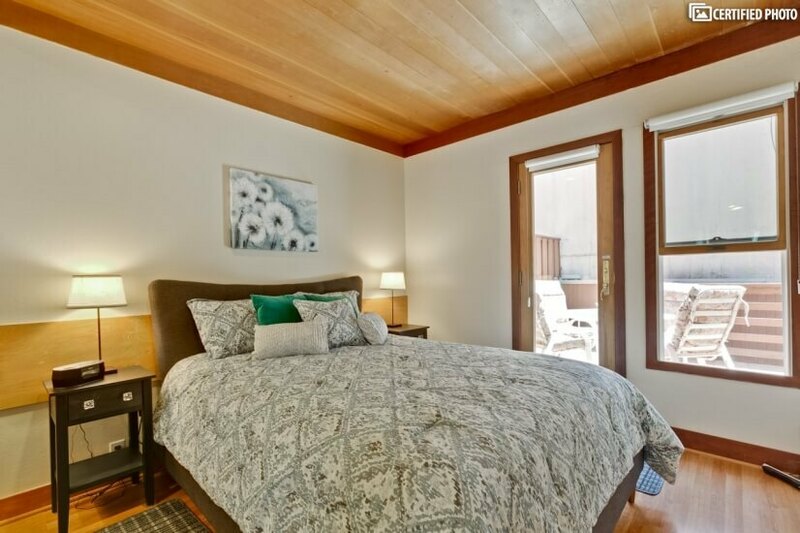 Down a short hallway, the two bedrooms are similarly well equipped with queen beds and both have patio access. 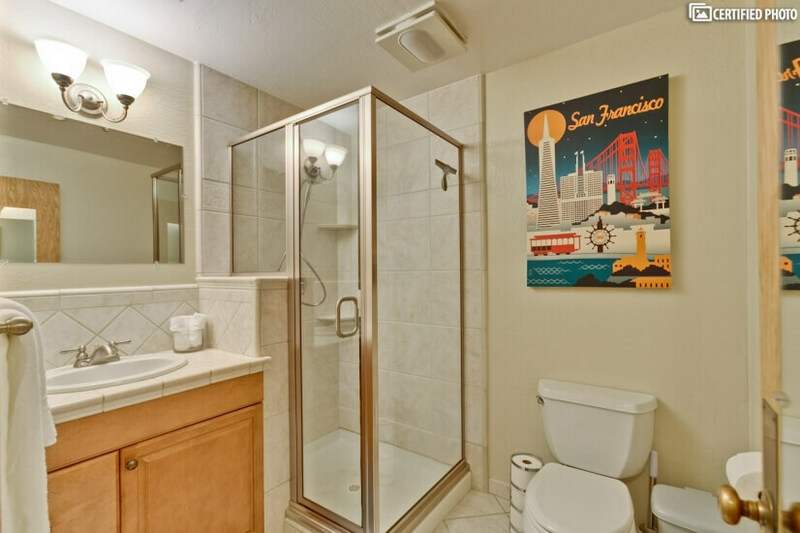 A tiled and charmingly decorated master bath has a walk-in shower. 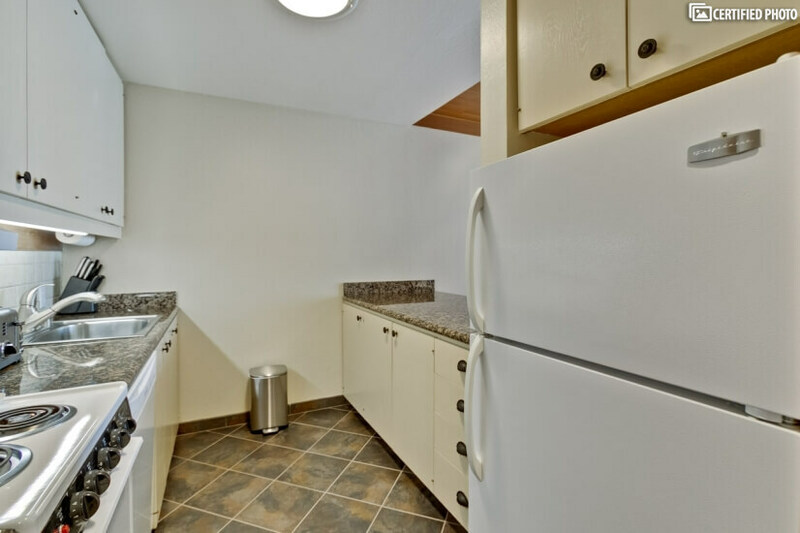 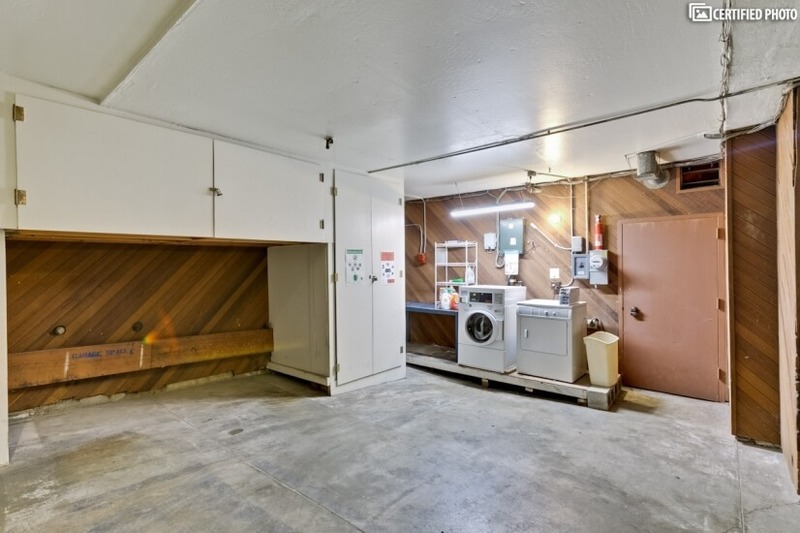 The garage has a shared laundry area, so you won’t need to leave the building on laundry day. 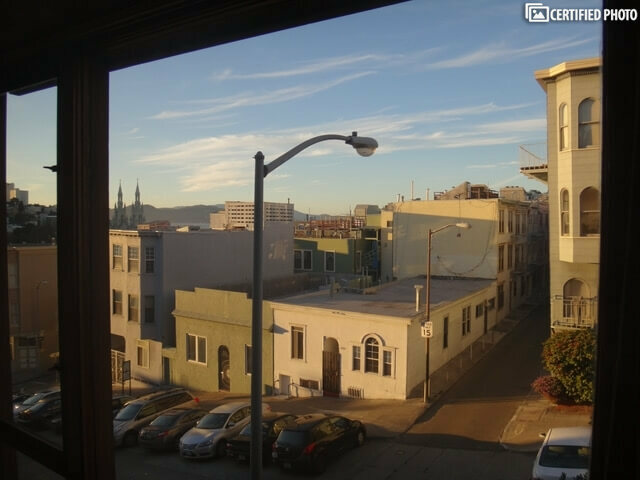 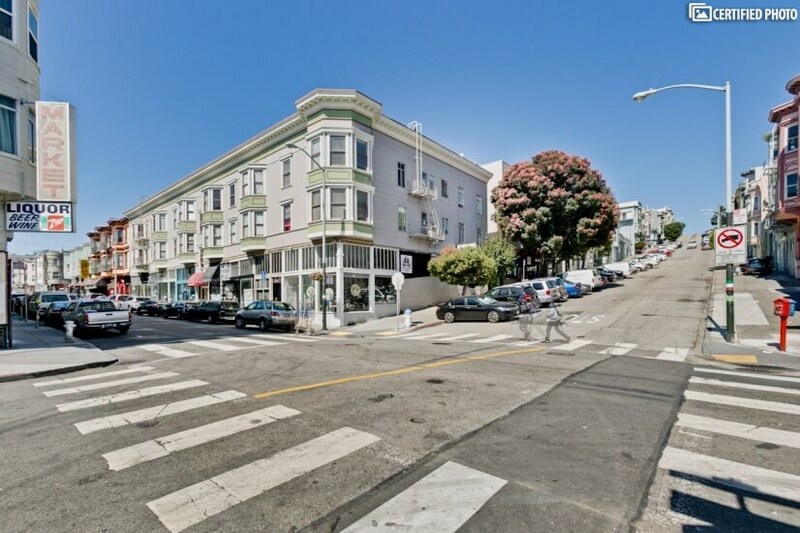 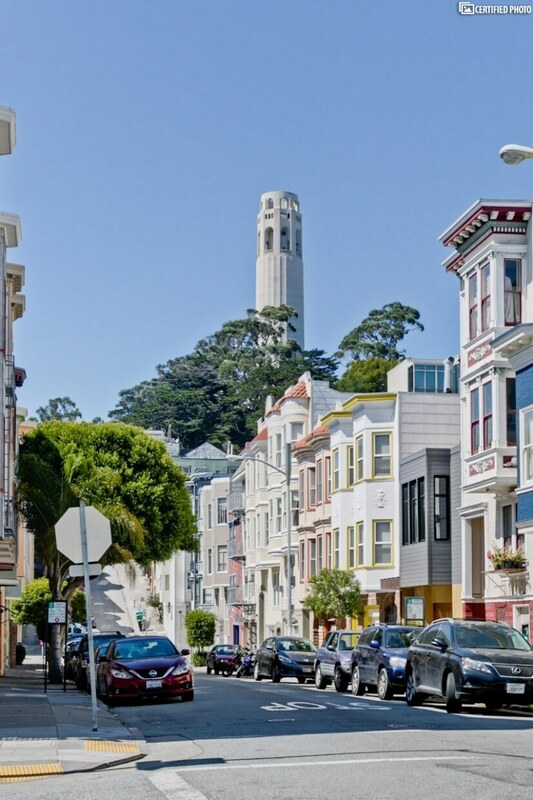 From this spot in Telegraph Hill, you can walk to North Beach, Embarcadero, Russian Hill, and Nob Hill easily. 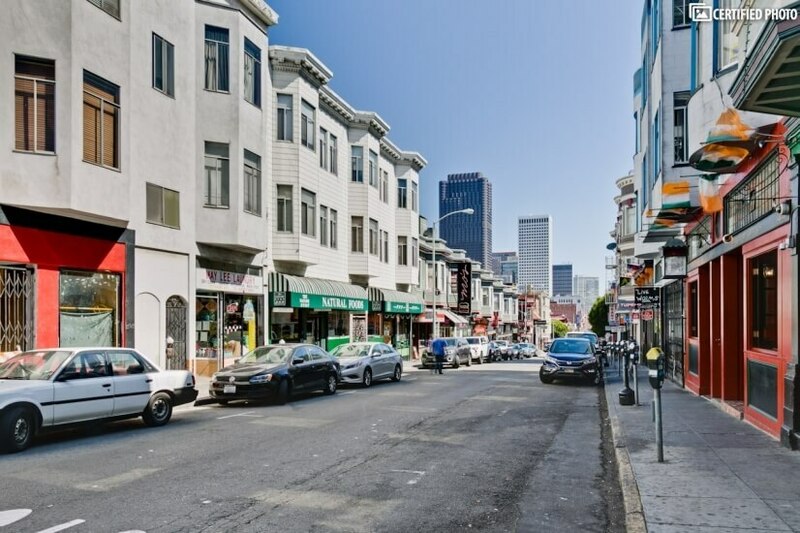 The Fortune 1000 companies within walking distance are McKesson, PG&E, Gap, Charles Schwab, salesforce.com, Williams-Sonoma, Levi Strauss, Big Heart Pet Brands, and Wells Fargo. 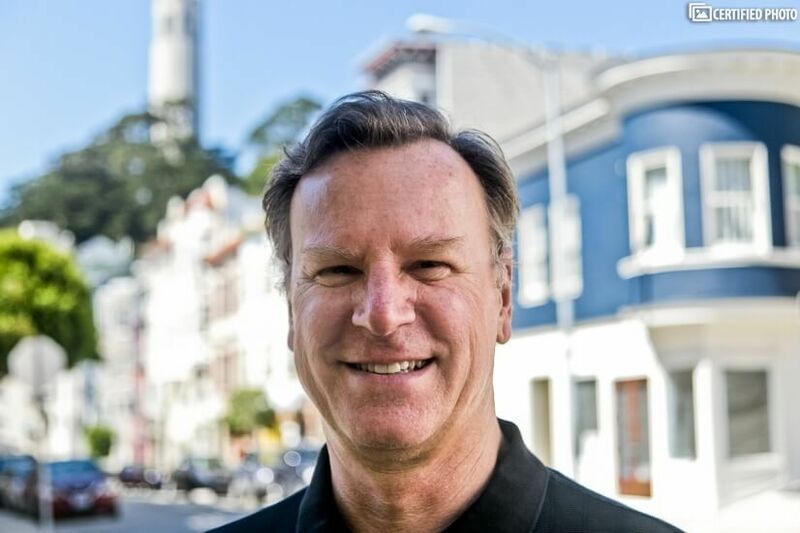 Joining them are heavyweights like Bechtel, the Union Bank of California, Levi Strauss & Co., Blue Shield, Kimpton Hotels & Restaurants, URS Corporation, and Bank of the West. 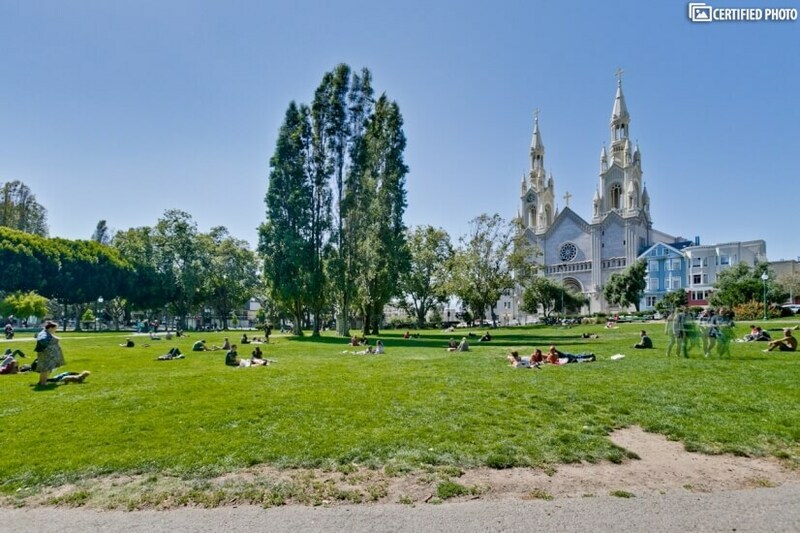 Saint Francis Memorial Hospital and Chinese Hospital are top medical facilities nearby, and USCF, USF, and UC Berkeley all have campuses or presences here as well. 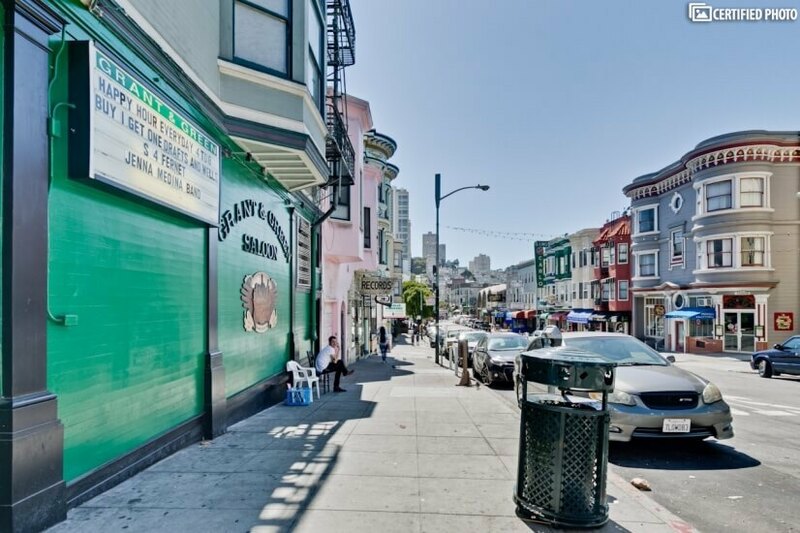 This part of San Francisco is renowned for its beauty and popularity with travelers. 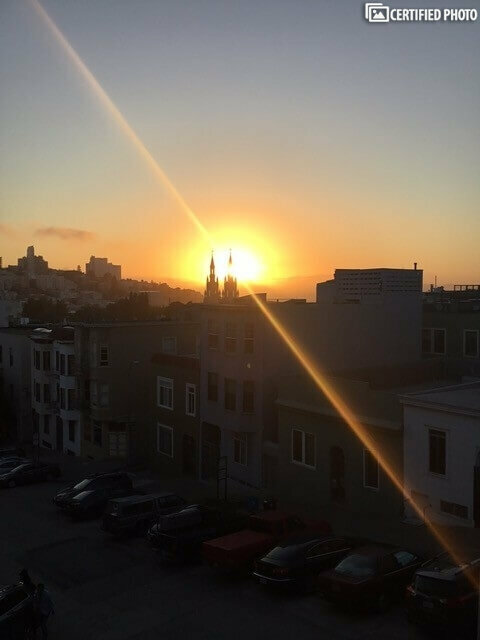 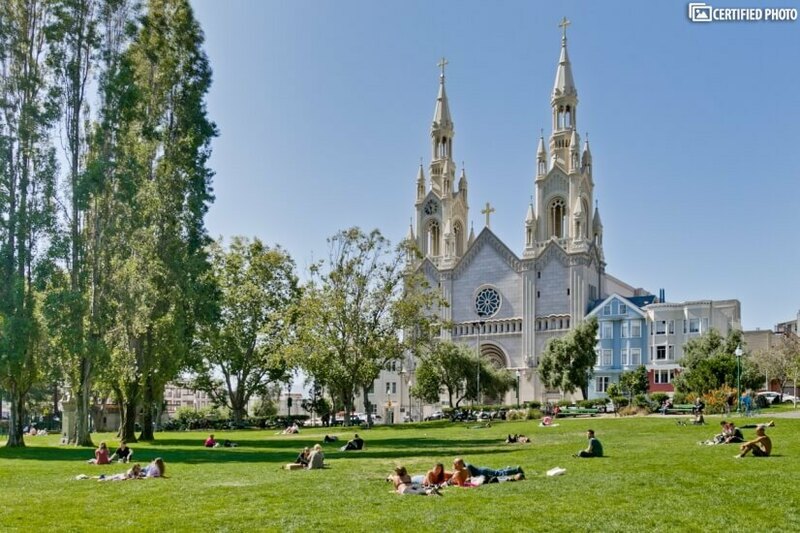 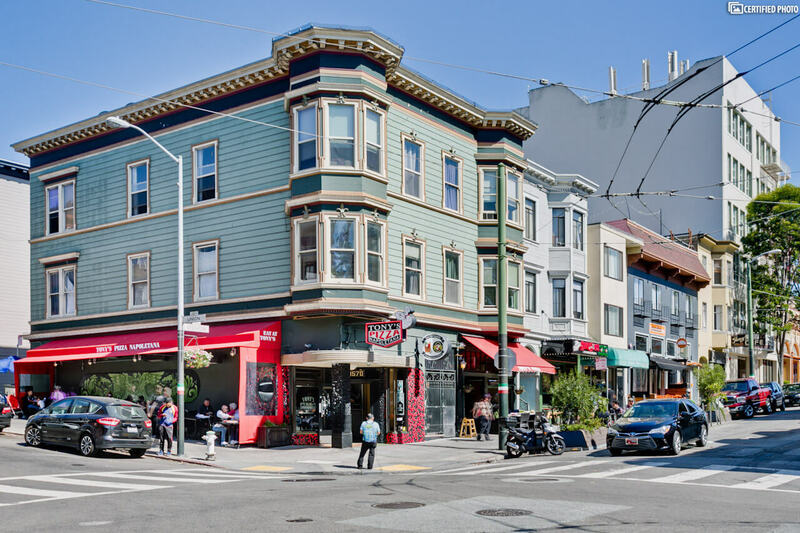 Nearby attractions include Coit Tower, Pier 39, Fisherman’s Wharf, Union Square, Greenwich Steps, the Ripley’s Believe it or Not Museum, Washington Square, and Pioneer Park. 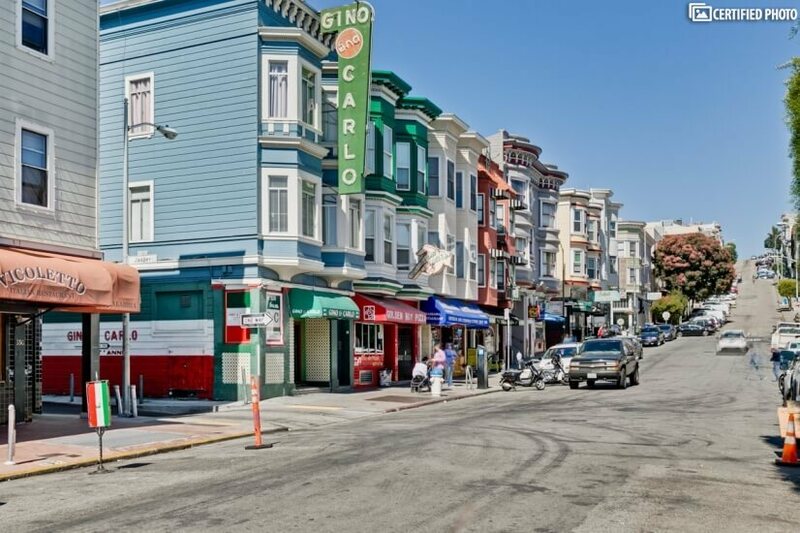 Some of the world’s best cafes and restaurants are here too, and as much upscale retail and shopping as you desire. 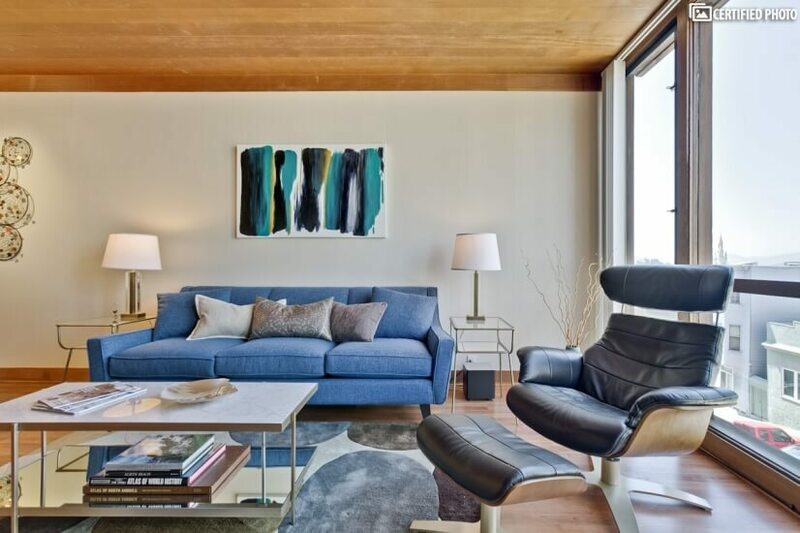 There’s so much to do, you may be torn between exploring this stunning city and relaxing from the workday in this alluring mid town penthouse.